This entry was posted in Foto Friday, Photos and tagged bridge, photos, Tacoma, Tacoma Narrow's Bridge. This entry was posted in Photos, Quotations and tagged eat, flowers, food, garden, Julia Child, nature, photos, Pt. Defiance Park, quotation, Tacoma. This week’s photo challenge is summer lovin’. Show the pleasures and delights of summer. For the first time this summer I’ve experienced numerous baseball games. I watched the Seattle Mariners and the Tacoma Rainers. 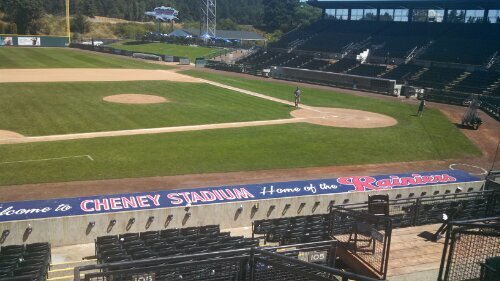 Today, I attended a Tacoma Rainer’s game on a beautiful blue sky and warm summer day. It was a little scary at times, but we won 4-3. I had the best hot dog with all the fixings! Click for more summer lovin’ photos. This entry was posted in Photos, Weekly Photo Challenge and tagged baseball, photos, postaday, Seattle Mariner's, summer, Tacoma, Tacoma Rainer's, weekly photo challenge. This entry was posted in Foto Friday, Photos and tagged Foto Friday, garden, nature, photos, Pt. Defiance Park, Tacoma, waterfall. This entry was posted in Foto Friday, Photos and tagged downtown, Foto Friday, photos, sunset, Tacoma, Tacoma Dome. This entry was posted in Foto Friday, Photos and tagged beach, photos, Ruston Way, Tacoma, waterfront. This entry was posted in Foto Friday, Photos and tagged abstract, Museum of Glass, photos, sunset, Tacoma.